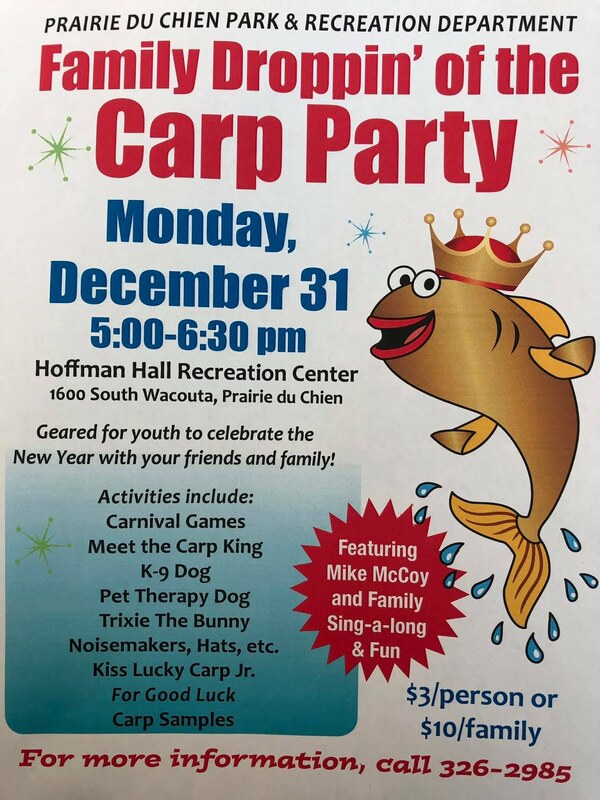 Hard as it may be to believe, 2014 is all but gone – which, here in the Driftless Region, can mean only one thing: Carp Fest and the Droppin’ of the Carp! A carp? They drop a carp? Yep: starting at 11:59 on New Year’s Eve, a whole, frozen, gussied-up, 20 to 30 pound carp named “Lucky” is slowly lowered by crane onto its throne for Prairie du Chien’s Droppin’ of the Carp countdown. Okay but … a carp? Prairie du Chien is along the Mississippi River and, as such, its economy benefits from the fishing industry, so a carp makes some sense. Also, many cultures – primarily Asian but why split hairs? – revere the carp as a symbol of prosperity and good luck, which also explains the name “Lucky.”. So dropping a carp is a lot less random than it may seem. After Lucky ascends from the heights at midnight to settle regally on its throne in the first second of New Year’s Day, folks looking for luck, fun, or just a touch of “ick,” line up and await their turn to plant a kiss on the dead fish. A kiss that, like one placed on the Blarney Stone in Ireland, is said to impart luck upon the kisser, if not the kissee (as their luck has clearly already run its full course). 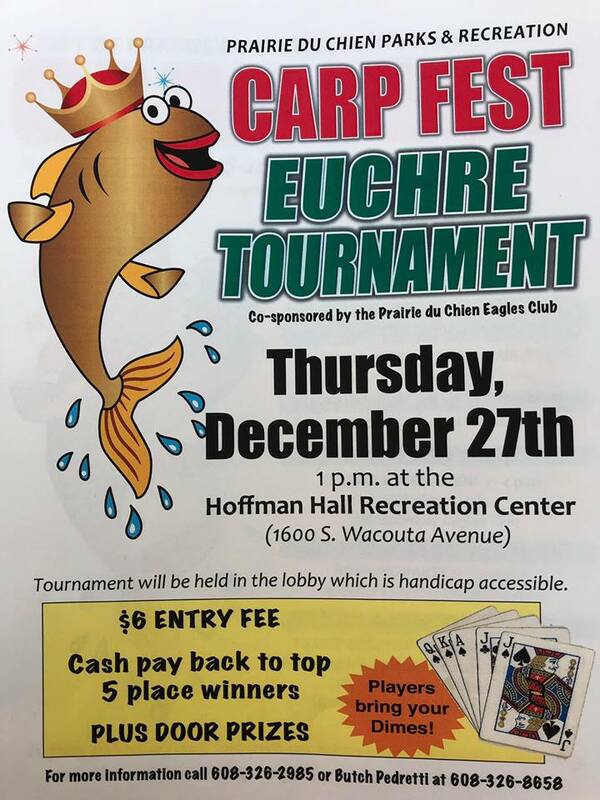 Of course, Carp Fest is not just the Droppin’ of the Carp but rather, a separate, related, month-long event. 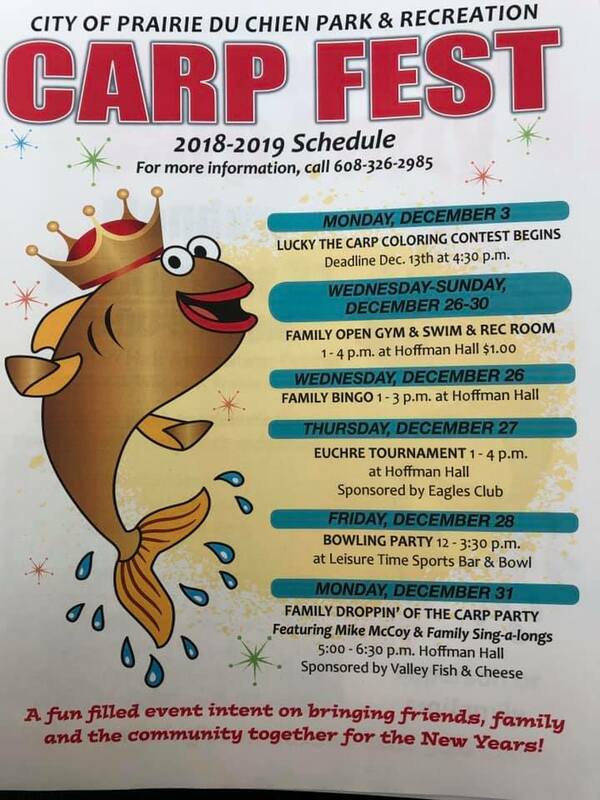 All manner of festivities, contests, and events make up Carp Fest. Both it and the Droppin’ of the Carp ceremony attracts thousands of people to the Driftless region and Prairie du Chien each year. So many, in fact, that the claim is that this modest, Driftless Region town doubles its population during the festival – and that’s no carp.